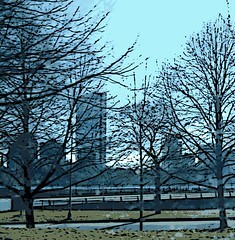 This image began as one of the photos I took during a mid-January excursion into Boston and Cambridge. I was trying out my new digital camera that day, trying to see if I could get clear pictures from a moving car (passenger seat only! ), because I often take pictures that way! This was the view from Memorial Drive, which runs along the Charles River on the Cambridge side; I glimpsed the John Hancock Building (over on the Boston side), so I took a quick picture. I recently edited the photos I took that day, and in fact, this is the first one I edited. The original photo was problematic because the building kept getting lost behind the trees. I opened Painter IX to try posterizing the image, but that didn't really do the trick. I decided to try digital woodcut, and found that when I adjusted the "heaviness" control, I liked the effect. So here it is. . . .